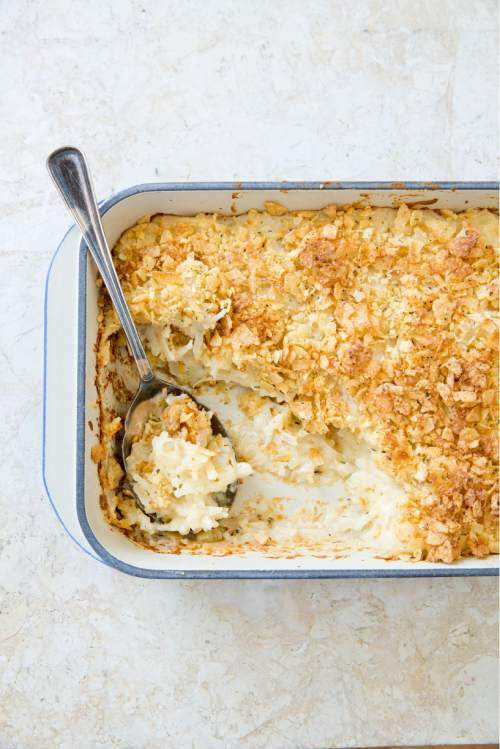 Cookbooks • New recipe elevates Utah's famous funeral potatoes. Courtesy | Cook's Country Eats Local The new "Cooks Country Eats Local" offers a new take on Utah's funeral potatoes. 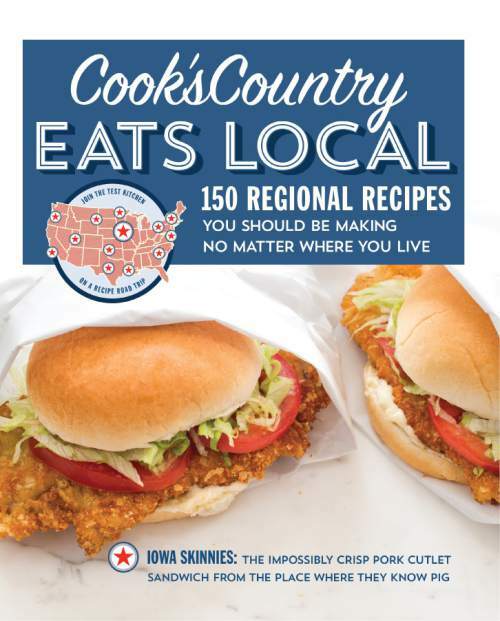 Courtesy | Cook's Country Cook's Country East Local: 150 regional recipes you should be making no matter where you live. In Utah, ham without funeral potatoes would be as depressing as eggs without bacon or peanut butter without jelly. This casserole  which got its name because it&apos;s easy to make and serve to grieving families after a funeral  is a mainstay at many family gatherings especially during the holidays. But a new cookbook, "Cook&apos;s Country Eats Local," dares to do the unthinkable with Utah&apos;s signature casserole: It suggests that cooks replace the condensed soup  usually cream of chicken or mushroom  and make a homemade white béchamel-like sauce. What?! Can the Beehive&apos;s beloved funeral potatoes be truly authentic with a classic French white sauce? "This cheesy potato casserole is commonly attributed to the Mormons, though versions of it have popped up all over the country," editors wrote. "Most recipes rely on the convenience of condensed soup, but we were sure that swapping the can for fresh flavors would yield an ultrasatisfying casserole in no time." After softening chopped onions in butter, editors added flour to create a roux. Next, they stirred in chicken broth and half-and-half to make a simple base, normally created by canned soup. The recipe (see box) isn&apos;t completely gourmet as it calls for frozen hash browns. "Using frozen shredded hash browns for the potatoes cut hours out of our prep time without sacrificing the dish&apos;s flavor or texture," the authors noted. And instead of the traditional crushed cornflake topping, this updated casserole is topped with crushed sour-cream-and-onion flavored potato chips before baking. Altogether, it&apos;s Utah elevated, the book noted. "At last, we had lush, homemade flavor alongside the convenience of store-bought hash browns and potato chips  these funeral potatoes proved a delicious compromise." Funeral potatoes aren&apos;t the only traditional recipe getting a modern twist in the cookbook, officially called "Cook&apos;s Country Eats Local: 150 regional recipes you should be making no matter where you live." Recipes like Pittsburgh wedding soup, Carolina red slaw and Iowa skinnies are updated in the publication, written and tested by the same editors as Cook&apos;s Illustrated and Cook&apos;s Country magazines. "Regional recipes often stay put because critical ingredients can be hard to find, but our test kitchen has come up with clever substitutions to make these dishes accessible in any kitchen," the editors wrote. The book, for example, offers replacements for the hard-to-find chiles in New Mexico pork stew and proves that green tea rub and mesquite wood chips give kalua pork the same flavors usually obtained with Hawaiian banana leaves and kiawe wood. While home cooks might like the streamlined funeral potato recipe, Utah restaurant institutions, such as Chuck-A-Rama, won&apos;t be switching any time soon. Every Sunday, the buffet restaurant serves more than 700 pounds of "sour cream potatoes" to customers at its 12 stores in Utah and Idaho. The dish is made with shredded cheddar, sour cream and, of course, condensed soup, said CEO Duane Moss. "We call them sour cream potatoes," he said, "but people still say, &apos;Oh you mean funeral potatoes.&apos; "
Adjust oven rack to middle position and heat oven to 350 degrees. Melt butter in Dutch oven over medium-high heat. Add onions and cook until softened, about 5 minutes. Add flour and cook, stirring constantly, until golden, about 1 minute. Slowly whisk in broth, half-and-half, salt, thyme, and pepper and bring to boil. Reduce heat to medium-low and simmer, stirring occasionally, until slightly thickened, 3 to 5 minutes. Off heat, whisk in cheddar until smooth. Stir potatoes into sauce, cover, and cook, stirring occasionally, over low heat until thawed, about 10 minutes. Off heat, stir in sour cream until combined. Transfer mixture to 13-by-9-inch baking dish and top with potato chips. Bake until golden brown, 45 to 50 minutes. Let cool for 10 minutes before serving. To make ahead • Potato mixture can be refrigerated in baking dish, covered with aluminum foil, for up to 2 days. To serve, bake potatoes, still covered with foil, for 20 minutes. Remove dish from oven and uncover. Top with potato chips and bake until golden brown, 45 to 50 minutes.